Today I'm featuring The Night Watch by Sarah Waters, borrowed from the library. So this, said Kay to herself, is the sort of person you've become: a person whose clocks and wrist-watches have stopped, and who tells the time, instead, by the particular kind of cripple arriving at her landlord's door. Page 56: "She walked stiffly, rather bowed, perhaps only self-conscious, but Helen saw her, for a second, as a stranger might: saw how handsome she was, but also how grown-up, how almost matronly; for you could catch in her something of the angular, wide-hipped, narrow-breasted figure she'd have in earnest in ten years' time." My thoughts: I am fond of stories set in London during the World War II era. Waters's novel centers on four characters whose lives intersect over a six year period from 1941 to 1947. 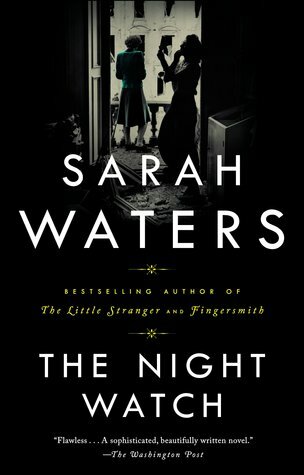 From Goodreads: Moving back through the 1940s, through air raids, blacked-out streets, illicit partying, and sexual adventure, to end with its beginning in 1941, The Night Watch tells the story of four Londoners - three women and a young man with a past - whose lives, and those of their friends and lovers, connect in tragedy, stunning surprise and exquisite turns, only to change irreversibly in the shadow of a grand historical event. Friday Focus: The Friday 56 & Book Beginnings #99 was originally published by Catherine for bookclublibrarian.com. This post cannot be republished without attribution. Retweeting and sharing on Google+ are encouraged and appreciated.